Last Thursday the Dietary Guidelines Advisory Committee — a group of 14 nationally-recognized nutrition experts tasked by the US government with spending two years reviewing the latest nutrition science — made public the summary scientiﬁc report  of its ﬁndings. The overall body of evidence examined by the 2015 DGAC identiﬁes that a healthy dietary pattern is higher in vegetables, fruits, whole grains, low- or non-fat dairy, seafood, legumes, and nuts; moderate in alcohol (among adults); lower in red and processed meat; and low in sugar-sweetened foods and drinks and reﬁned grains. Vegetables and fruit are the only characteristics of the diet that were consistently identiﬁed in every conclusion statement across the health outcomes. Whole grains were identiﬁed slightly less consistently compared to vegetables and fruits, but were identiﬁed in every conclusion with moderate to strong evidence. On average, current dietary patterns are too low in vegetables, fruit, whole grains, and low-fat dairy, and too high in reﬁned grains, saturated fat, added sugars, and sodium. If whole grains were consumed in the amounts recommended in the Food Patterns, whole grains would provide substantial percentages of several key nutrients, such as about 32 percent of dietary ﬁber, 42 percent of iron, 35 percent of folate, 29 percent of magnesium, and 16 percent of vitamin A.
That’s impressive. And imagine — we’d get all these key nutrients just by making half our grains whole. 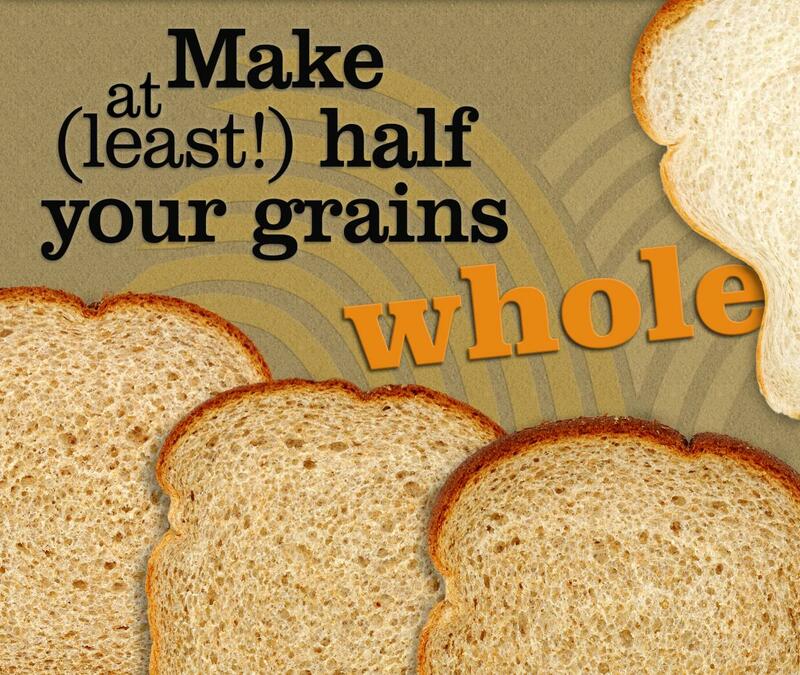 Double those numbers, and think what would happen if we made all of our grains whole! We’ll admit that Oldways and the Whole Grains Council would have been pretty happy if the DGAC had recommended upping the ante to “make all your grains whole” or some other level above half. But we’re realists. 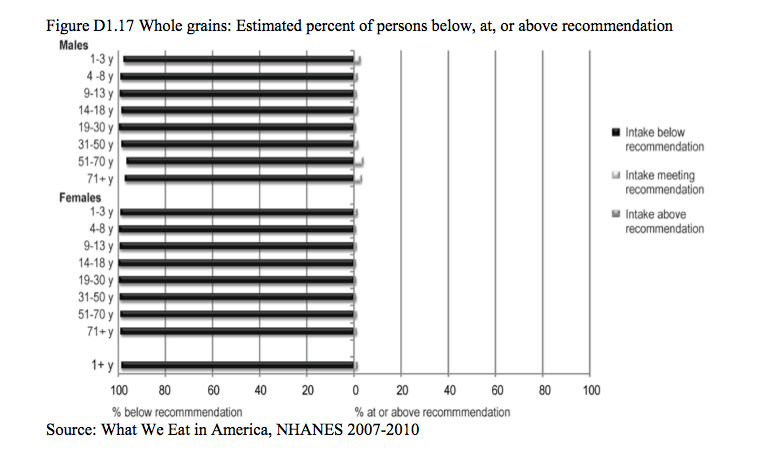 Since Americans overall don’t even come close to making half their grains whole (according to Sept 2013 USDA numbers , actual consumption achieves the catchy slogan of “make 12% of your grains whole), it makes sense to simply keep pushing toward that halfway point for the time being.